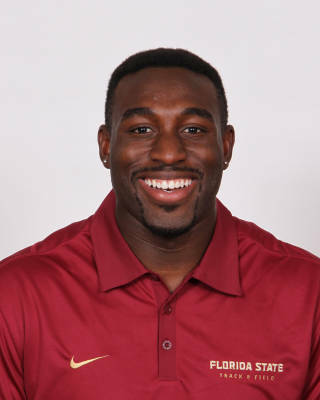 Fifth-year senior who was selected as one of the team’s three captains in his final year of eligibility…the most experienced Seminole in coach Dorian Scott’s young throws group…small school product who was introduced to the hammer and weight throw as a true freshman and enters final year ranked second and third, respectively, on FSU’s all-time lists. Enjoyed his finest season collegiately, posting a pair of victories and qualifying for the NCAA East Preliminary in the hammer for the second time…registered the No. 2 hammer mark in school history (62.55m/205-2) to win the Seminole Invitational…followed up with a silver medal performance at the ACC Outdoor Championships, helping the Noles to the team title…second-best throw of the season came at NCAA East (61.04/200-3) to place 21st…also scored a win at the Seminole Twilight…highlight of the indoor season came at ACC Championships where his lifetime-best mark (18.81m/61-8.50) in the weight throw was good for sixth as the Noles won the title…made a giant leap early with an 18.80 mark at Cherry & Silver to place third. Closed out his sophomore year by recording his top hammer mark (60.77/199-4) at the NCAA East Preliminary, to finish 13th…contributed a third-place finish to FSU’s team title at the ACC Outdoor Championships with a throw of 56.84…scored his first career win at the Seminole Invitational with a then PR of 59.07…competed in only two indoor meets but made a quantum leap in the weight throw (18.36/60-3) to place sixth at the ACC Championships; his first indoor points at the conference level. Competed in nine meets outdoors as a redshirt freshman, demonstrating significant progress…highlight of the season came at the ACC Outdoor Championships when his lifetime-best mark of 57.79 (189-7) earned a fourth-place finish…posted his first career victory at the Seminole Invitational…put on his FSU uniform for the first time indoors for four meets, competing in the weight throw…top mark and best finish came at the season-opening Auburn Invitational (17.59/57-8.50) to place sixth. Arrived at FSU as a walk-on from Seven Rivers Christian in Lecanto, Fla., where he competed in the discus and shot put…one of the team’s emotional leaders…in addition to athletics is a talented singer who performs as a member of the A’caphiliacs, an A Capella choir…accounting degree holder who is pursuing a second degree in real estate…born August 14, 1992.